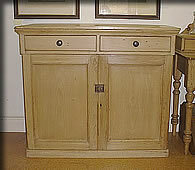 Late Victorian / Edwardian pine cabinet. Approx 80 and 1/2" x 18 and 1/2" depth including overhangig cornice (15" depth inside so not deep enough for hangers) and 46 and 1/2" width. At present the top half is not fitted but can fit with shelves/hooks as required. Fairly pale pine. Very clean and sound condition for its age. 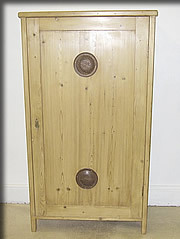 Edwardian pine and glazed wall cupboard. Original glass. As you are probably aware these are hard to find and many were originally on top of dresser bases as was this one. 40 and 1/2"H x 49"W x 10 and 1/2"D . Quite a rich pine colour but not dark. 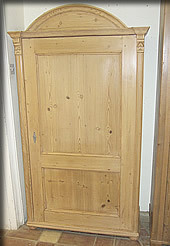 Unusual Victorian pine cupboard with four doors. Shelved inside. In very nice condition for its age. Almost 48"W(121cm) x 48"H(121.5cm) x 18 and 1/4"D (46.5cm). 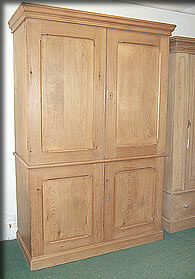 Circa 1900 pitch pine cupboard - shelved inside. 37 and 1/2"W x 78"H x 18"D including any overhang of top or plinth. Internal depth of shelves is 15 and 3/4". It is typical stripped pitch pine with the accentuated wood grain showing and is in good strong clean condition for its age. A little lighter than appears in this photo. 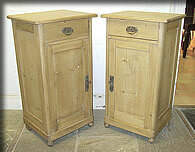 Unusually small Victorian pine corner cabinet in excellent condition. 26"H x 20"W x 12 and 1/2"D. Length along each side 14 and 1/2". Genuine ones of this size are rare. 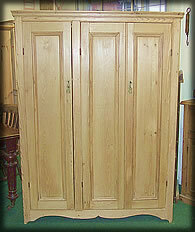 Narrow in depth so this lovely Victorian / Edwardian pine cupboard is ideal as a hall cupboard. 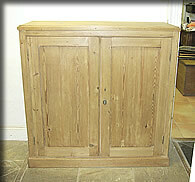 72"H x just over 38"W x 13 and 1/2"D.
Late Victorian / Edwardian pine cupboard in very good clean condition for its age. 42 and 3/4"W x 41 and 3/4"H x 16 and 1/2"D. Simple plain genuine cupboard with a nice feature in that the height of the internal shelves is adjustable on a "ladder" arrangement on the inside. 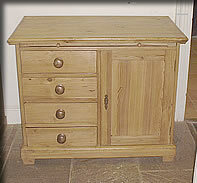 *PLEASE NOTE* Our pine furniture has a wax finish (unless otherwise stated). The camera flash bounces off the buffed wax which can make items on our website look a bit glossy or even varnished, depending on your monitor settings. If in doubt please ask. Sorry, colour looks a bit grey here - it is better in the photo of the top of it as seen below. 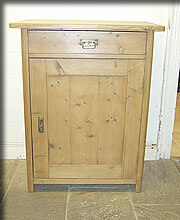 Antique pine cupboard / washstand cabinet. We have the original gallery and shelf for this cupboard but , as many people prefer a plain flat top, we have not put it back on after stripping the paint off. See photo below (which is also more accurate for colour) - it would not have a gap at the back if fitted back on for you. Continental, early part of last century. 36"W x 30 and 1/4"H x just under 20"D. The gallery with shelf would add 9" in height to the back. It has original little brass knobs. 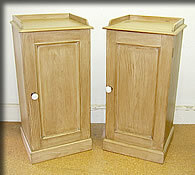 It is virtually impossible to find a genuine pair of Englsh Victorian pine bedside cabinets.These are a very close match. Approx 14"D x just over 15"W x 30 and 1/2"H including "gallery upstand". Please note that both doors open the same way. Nice mellow Victorian pine in very good order. 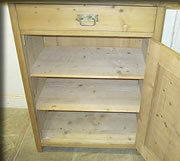 SORRY - THERE ARE MORE CUPBOARDS HERE - WE HAVE JUST MOVED AND HAVEN'T HAD A CHANCE TO PHOTOGRAPH AND UPLOAD THEM YET ! Approx 33 and 1/2"W x 42"H x 20 and 1/2"D (47.5cm) all including any overhanging trim ( the top has quite a large overhang as is often the case with these cabinets so could be trimmed a little on width if desired) . Antique pine cabinet, continental, early part of last century, in very good order. 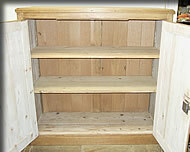 Cupboard with shelved interior below one drawer. Useful size as narrow in depth. Handsome Victorian / Edwardian pine cabinet with shelves in the right hand two-thirds and open in the left-hand third (currently has a rail although not deep enough for hanging clothes, possibly put more shelves in or use for broom/brushes etc). Just over 51"W x 67"H x 15 and 1/2"D including overhanging trim. Depth back to front of internal shelf 13 and 1/4". Sturdy cabinet in very good order and a useful shape. 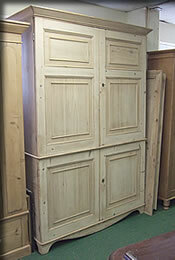 Unusual small and narrow antique pine cabinet with three doors. Approx 15 and 1/4"W x 67"H x 14 and 1/4"D. Internal depth 12". Continental, early part of last century. Original little metal knobs. 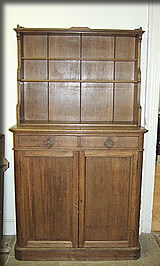 Unusual late Victorian / Edwardian Oak Cupboard with adjustable shelves above the cabinet. 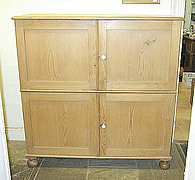 71"H x just over 40"W x 16 and 1/2"D. Good quality well-made and genuine cupboard. Only have a narrow gap for storage ? 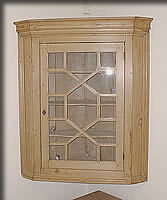 26"W(66.5cm) x 69"H(175cm) x and 15"D(38cm) including any overhanging trim or cornice at top. Internal depth 11"(28cm). 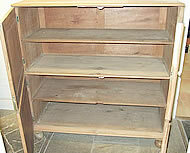 Shelved inside - see photo below. In very good condition - trim has been replaced. Continental, early part of last century. APOLOGIES IF A LOT OF OUR STOCK SEEMS SOLD OR RESERVED - WE HAVE BEEN BUSY BUT ARE WORKING HARD TO GET MORE RESTORED AND THEN FIND TIME TO UPLOAD ONTO THE WEBSITE FOR THOSE OF YOU UNABLE TO VISIT US HERE ! More available in the shop / storage. 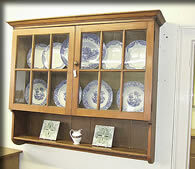 Some may be shown on the unrestored stock page such as the large housekeepers cupboard below (this one now sold). 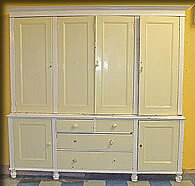 Please see unrestored stock page for details of this large housekeepers cupboard. 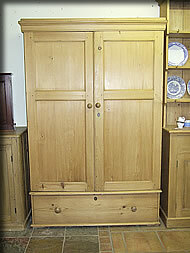 Lovely large Victorian pine 4-door "Housekeepers Cupboard". Approx 56" wide x 84 and 1/2" high x 25 and 1/2" depth (all including overhang of cornice at top/front). Internal depth of shelves approx 21 and 1/2". This is quite a rich colour - not a pale yellow pine. 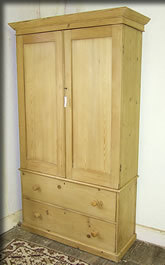 It is in excellent condition for its age, a very strong sturdy and capacious storage cupboard. Seperates into two pieces for moving.More photos available. An unusual size to find as not very deep back to front - this antique pine cupboard measures 38 and 1/2" wide including the architectural style overhanging cornice at sides x just under 71" high (just over 64" without decorative pediment) x 18 and 3/4" depth (including overhanging cornice). Internal depth approx 14". In very good order. European antique, early part of last century. 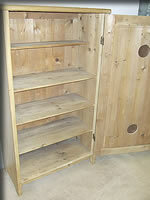 Antique pine cupboard with air vents in door and shelves inside - see photo below. Measures 33 and 1/2"W x 57 and 1/2"H x 16 and 1/2"D (including overhanging trim). In very good order. European antique, early part of last century. 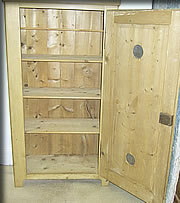 Antique pine larder cupboard with metal air vents in the door and shelved inside - see photo below. Approx 32 and 1/2"W x 14"D x 61"H. Early part of last century, continental and in very smart condition for its age. 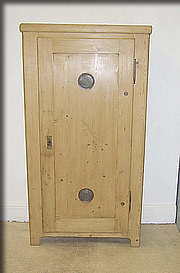 Early Victorian pine wall-hanging corner cupboard. 42 and 3/4"H x 37"W including overhang. 16"D. All original and generally in excellent order . 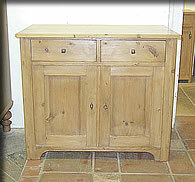 Edwardian era / early last century antique pine dresser base - continental. Unusually it has a pull-out bread or chopping board. 38 and 1/4"W x 31 and 1/2"H x 21 and 3/4"